The beginning of this catalogue study goes back eight years, when I spent ten months at the University of Michigan’s Kelsey Museum. 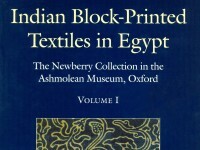 During the spring of 1987 I started research on the Museum’s Indian block-printed trade textiles, all of which had been collected in Egypt. At the time I received a letter from Louise Mackie at the Royal Ontario Museum in Toronto, urging me that on my return to Oxford I should look at the related collection in the Ashmolean Museum, as she remembered it to be 'of some size'. I knew by then that similar material could be found in many museums, but that most collections were only made up of a few dozen pieces. What a surprise it was, therefore, to come across something as remarkable as the Newberry Collection: historically of great value, unparalleled in size and quantity of designs, and potentially a great research source. The curator responsible for the collection was Dr James Allan, then Assistant Keeper of the Islamic collection in the Department of Eastern Art. Enthusiastically he took up my suggestion that a catalogue of the collection should be prepared. However, before any academic work could start, there was an immediate need for conservation of the textile fragments. We turned therefore to the J. Paul Getty Trust to fund both the conservation and the cataloguing of the material. A major grant was offered to the Ashmolean Museum in 1990, with funds available for two years of conservation work, as well as the preparation of the catalogue. The conservation project was carried out by the Department’s conservator David Armitage, with the assistance of Lorraine Rostant. I was responsible for the accessioning and cataloguing of the collection. Conservation and cataloguing were completed in 1992, and since then the printed textiles have been available for study. Early on it was decided that the collection should be published in its entirety, as it would thereby become available for further research. To present the material adequately, it seemed important to accompany the catalogue itself with a text that attempted a more detailed analysis of the textiles. A grant from the Leverhulme Trust made it possible for me to carry out the additional research. The financial assistance of both the J. Paul Getty Trust and the Leverhulme Trust is gratefully acknowledged; without their help this project would not have been possible. The Leverhulme Trust also funded research travels to the Yemen and India. During the five years I have spent in the Department of Eastern Art, it has been a particular pleasure to work together with Dr James Allan. His door was always open, and he has given much of his time and energy. His continuing support has been of great importance to me. His colleagues Dr Oliver Impey, Andrew Topsfield, and Shelagh Vainker all have been welcoming and supportive, and all have shared their expertise when I turned to them. When my work on the collection started in 1990. Mary Tregear was still the Keeper of the Department of Eastern Art, and her encouragement is gratefully acknowledged. David Armitage and Lorraine Rostant from the Department’s conservation laboratory were a wonderful collaborative team. During my research I visited numerous museums and collections elsewhere, both for seeing similar material and for discussing related topics with other colleagues. My gratitude goes to all those who assisted me on my visits. In Britain, John Guy, Rosemary Crill, and Jennifer Wearden at the Victoria and Albert Museum, Dr Venetia Porter at the British Museum, and Jennifer Scarce at the Royal Museum of Scotland, Edinburgh, all have contributed generously with comments and advice. Dr Jenny Balfour-Paul shared her knowledge of the intricacies of indigo dyeing. Dr Gillian Vogelsang-Eastwood, now in Leiden, The Netherlands, has been most helpful by giving me access to the material from Quseir al-Qadim when she was preparing her catalogue of the find­ings, as well as showing me the fragments from Qasr Ibrim. The superb collection in the Benaki Museum, Athens, was made available by Anna Ballian. Another great collection I have visited repeatedly is in the Ethnographic Museum in Basel, where Dr Marie-Louise Nabholz- Kartaschoff has always provided a particularly happy atmosphere to work in. In Cairo, I am grateful to the Director of the Islamic Museum, Dr Niamet Suleiman, and to Muhammad Abbas Muhammad Salim, as well as to Professor George Scanlon. In India, thanks go especially to the many colleagues and craftspeople I met there during my visit in 1994. The Calico Museum in Ahmedabad and its director Gira Sarabhai in particular were most welcoming, as was the National Institute of Design. Also helpful were Dr Joitindra Jain, Director of the Crafts Museum Delhi, Jasleen Dhamija, Ritu Kumar, Dr Lotika Varadarajan, and Jenny Housego. Hospitality in Delhi was provided by our friends Dr and Mrs Hanley. In Kutch the textile printer Mohammad Siddi and his sons, of Dhamadka, were generous with their knowledge and expertise, as well as with their hospitality. Judy Frater provided an introduction and invaluable linguistic assistance. The success of my travels in the Yemen would not have been nearly as great - nor as enjoyable - without the company and help of Dr Selma al-Radi. Merilyn Hywel-Jones was a wonderful fellow traveller. In the United States, the Textile Museum has always been welcoming, and its staff most helpful. Carol Bier has repeatedly made time in her busy schedule, not only to make the collections available, but to discuss our research as well. Particular thanks must go to Dr Mattiebelle Gittinger, whose work and personal integrity has set a model in more than one way. At the Oriental Institute in Chicago, Dr Donald Whitcomb and Professor Janet Johnson are especially acknowledged. At Oxford University Press it was my great pleasure to work with Paul Cleal, designer of these volumes, and Anne Ashby, my editor. Finally, I am still grateful to Professor Elaine Gazda, Director of the Kelsey Museum, University of Michigan, for first invit­ing me to take an interest in that museum’s collection of Indian fragments, and to Louise Mackie for pointing me in the direction of the Newberry Collection.